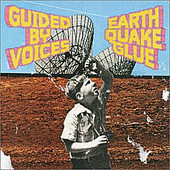 Guided By Voices'Earthquake Glue, their sixteenth studio album in as many years, finds the band drawing comparisons to wine: they grow better with age. Often known for his quantity over quality approach to songwriting, front man/mastermind Robert Pollard reverses it for Guided By Voices' latest full-length, delivering fifteen sharp, punchy, quick knock-out songs that average three minutes, but last long after each song has ended. Somehow keeping his lo-fi aesthetic in tack, Pollard delivers a rock 'n' roll record with enough production chops to garner a possible radio hit in songs like "Useless Inventions" or album opener "My Kind of Soldier", if only radio was based on the quality of song. Songs like "She Goes Off At Night", "Mix Up The Satellite", and "Dead Cloud" demonstrate Pollard's charms in each song; his ability to rock out and make it fun, write a clever hook, be as quirky as he wants, and still come out shining with a head-boppin' melody. It's all here, track to track, minute to minute. Pollard's tendencies to be unpredictable and even more inconsistent seems to have been traded in for stability and consistency - at least for now - in this fifteen more-than-capable rock nuggets. I'll give it a B+.